I just found a possible use for it. Has anyone seen these conversion kits that convert a Harbor Freight mini mill into a "high precision" CNC? about $700 for the mini mill plus about $629 for the conversion kit. Not sure but it does not look like the stepper motors or controller are included. So the X-Controller and three motors should finish it off nicely. I am still interested in the X-controller, ready too buy actually. The mechanics of building this machine don't worry me, but I am not as well versed in the electrical side of things. So having all the components ready to go in one neat box is appealing. Plus this will be my first cnc machine, so this simpler the better at this point. I wonder if inventables will include the little plugs to put on your stepper motor wires that plug into the x controller? I do agree about the EStop I would have liked the ability to relocate it, as I plan to mount the X controller upside down under my x carve table. 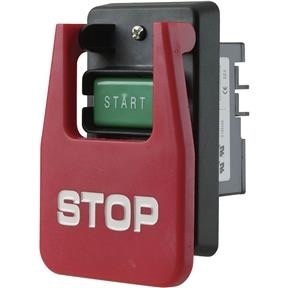 I will either put an EStop on the Ac power going to the x controller or open the x controller and unplug the current EStop and run some wire out to an external EStop. In either case I have one of these I plan on using. That's the switch I have. I can say with confidence it works great. I seams to me that the X controller was design for the newbie, an easy solution for someone that is new to the CNC game and or doesn't have any existing equipment, like me. To me Easel is kind of the same thing, easy straight forward intro into cnc software. To be honest I was really apprehensive about getting into the X Carve because of the preceived learning curve. After playing with easel I thought jeez I can do that. So I ordered it, only time will tell if I can get the thing up and running. I think that Inventables is trying to make CNC easier and less intimidating to appeal to more people, like me. Yep, spot on. Ease of entry into CNC is key when looking at what we think Inventables should and shouldn't sell. If we keep looking through that lens then the X-Controler makes perfect sense. Plus I have a feeling that the included board will provide smoother operation as well. It is not 4x the price of the current kit. You forgot to take into account the fact that the X-Controller includes the power supply too. Therefore this is 196$ (current arduino/gshield kit + power supply) vs 329$ (X-Controller)... or 1.68x more (1.64x if you also count the estop). You might check out the Planet CNC controllers: http://www.planet-cnc.com/index.php?page=features and http://www.planet-cnc.com/index.php?page=hardware. I have them on 3 mills and love them very much. They offer extremely customization for mill setup with just a few clicks in a menu. They are far more robust then GRBL and offer many features that are still still found in GRBL or any of the GUIs like Chilipeppr, Easel or UGS. If you need a good controller and software package for a custom mill, I will suggest giving them a look. I just want them to start selling "X-Carve" bumper stickers. We are looking for people to test drive X-Controllers. Check out this forum post. Looking at the photo of the rear of the unit, power leads with all manner of plugs can be accommodated. For 240VAC, Type F is probably most common, but options for UK, NZ, AU would be nice. UK for me! Will wait until this is available before buying my XCarve! any updates on production runs of the x-controller? We had a bit of an ordering problem with the PCBs. The 4 pin stepper motor terminal block arrived as the wrong type. We caught it before the boards were fabricated, but we had to get the right ones re-shipped to us. They arrived yesterday and will be assembled soon. I think that takes about a week to build, program and test. Thank you for the update. I have had some issues with wires not crimping properly (my fault) and the terminal blocks being difficult to get at. This whole anticipation for the X-Controller has made me wonder whether I should just bite the bullet and go the Gecko G540 & LinuxCNC way. Though there are two good reasons I am willing to wait a little longer. (a) I'd much rather use an RPI than a bulky (and power hungry) old desktop with a parallel port and (b) GRBL is a lot easier to configure. Take a look at the Planet CNC system. It runs off USB so just about any computer will work fine and it blows GRBL out of the water. You have the freedom to pick and choose your drivers to match your steppers and it has a ton of features that GRBL is missing. http://www.planet-cnc.com/index.php?page=features. I run 3 of their controllers on 3 mills and will be adding a fourth on shortly on the next mill. Never had a controller side issue and they run rock solid. Even though both the hardware and software of Planet CNC do look promising, this solution is not high on my list because it runs on Windows. There is another alternative to run LinuxCNC on a small embedded system (i.e. a Beaglebone Black with a cape), but this is by no means plug and play. I'd rather set and forget the ~30 parameters of GRBL than fiddle with a maze of ini and hal files. My top preference currently is GRBL + bCNC on a RPI. Z-touch probe terminal would be great. Who sells this puck and how does it work?